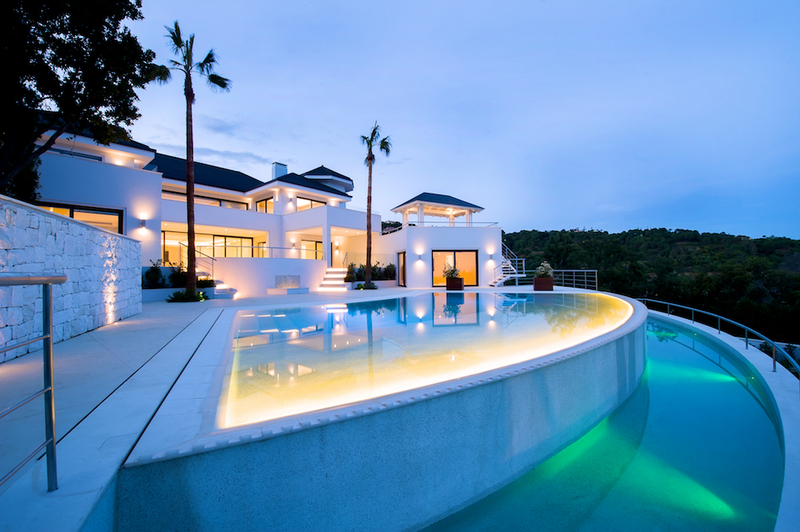 Quite possibly the most luxurious contemporary villa currently for sale in La Zagaleta, this unique property has been designed to reflect the style of mega yachts and offers unrivalled luxury with one of the best views of the coast. Only the most exquisite materials have been used in the construction and interior design. Accessed by a magnificent entrance with water, light and music features, the property has been distributed over several levels for a maximum of convenience and privacy and features grand staircases and a panoramic elevator. The main living area consists of a formal reception room as well as a more informal, cosy family living room, connecting with the spectacular kitchen and the dining room with fireplace and panoramic views. The extraordinary Master Bedroom suite has separate “his & hers” entrances as well as separate dressing rooms and bathrooms, and is surrounded by no less than four terraces, offering panoramic views all around the property. A total of 7 spacious bedrooms, all with walk-in wardrobes and luxurious en-suite bathrooms, offer plenty of accommodation for family and guests. In addition, there is a separate guest apartment, as well as a staff apartment with two bedroom suites. A highly luxurious spa area offers a saltwater indoor pool with counter current and hydro massage zone, a sauna, Turkish bath, Roman bath, ice room etc. The gym has open sea views and opens to an outdoor exercise area. For entertainment, there is a home cinema, bar and disco, and even a golf simulator. Garage for 12 cars. The gardens blend Mediterranean and tropical designs, and a large infinity pool connects the villa with the azure blue Mediterranean in the background. There is no property like this for sale anywhere in Marbella, and possibly the rest of Europe. Please note that for viewings, proof of funds will be required. Please, send me more information about ref W-024GUP, Villa in La Zagaleta, Benahavis or similar properties.